Behold Osama Obama The Cigarette Smoker! Soooooooo, Osama Obama is a cigarette smoker. My, oh my! Why, what will The All Time King of Lies and The Ruler of LiarDom, Al O'FrankenFailure say about this? He's always quick to point out that First Lady Laura Bush is a cigarette smoker. 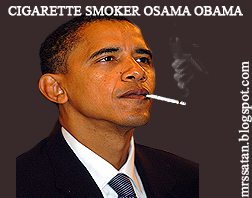 I wonder if he'll call attention to Osama Obama's nicotine habit? And Osama Obama, who is two years into his first term as a U.S. Senator, is seriously considering a run for president in 2008 when he'll have a total four years experience. Yeah, there's nothing like a complete lack of political experience to run on, is there? Besides, we can't have Osama Obama - a CIGARETTE SMOKER - in the White House! Who was the last President that smoked cigarettes, anybody know? He has to pre-date JFK because I don't think JFK smoked cigs. Truman smoked, Ike smoked, JFK smoked cigars, Nixon smoked, Ford smoked. Clinton smoked cigars. Thanks. I've since looked into it a bit further. I cannot find any evidence that Nixon or Ford smoked cigarettes after the 1960s. Could not find anything to indicate Nixon or Ford smokeing cigarettes prior to 1960s. Did find in a couple of places (simple Google searches) where Nixon and Ford smoked a pipe occasionally. JFK, cigars, yep. Unsure if he smoked cigarettes. Truman and Ike: I haven't yet confirmed they smoked cigarettes, but don't take that to mean I'm doubting you. Thanks for the info, Cord. You people are idiots.. That pic is a blatant photochop. You repubs are dying for any excuse to hate a good man. What a bunch of low-lifes. You have no sense of humor, do you Stuart? Gee, has anyone on the Democrat side photo-shopped Bush as Hitler? I suppose that type of pho-shopping is okay with little Eichmanns like you. Osama Obama has 2 years of (in)experience as a Senator. Before that he was debating things in the Illinois Senate like raising the cost for driver's licenses at the DMV. And you think that qualifies him to run the country? Not only are you one of the dumbest dumbasses who's ever commented on my blog, you are the lowest of low lifes I have ever encountered. Find a bridge and jump off it and do us all a favor. Nice, fake blog you have there too, little man. I think the fact he's a cigarette smoker is so trivial that it doesnt even merit our attention. Millions of Americans have this same bad habit, and like Obama, are trying to quit. It's a sad day in our country when someone seriously takes the fact that someone smokes cigarettes as a factor on whether or not to vote for them. it's just a joke moseropoly. I'm one the the dying breed of smokers too. His religion: yes, there are rumors he is a Muslim, in fairness, he has refuted them - but who knows for sure. The Salute: I know the image you refer to, it has made the rounds on the internet. It was explained that the picture of him not saluting was taken prior to actually playing the National Anthem. Whether his explanation is true or not, I dont know. I will say that it certainly appeared he refused to salute or honor the flag. God: I do not know, nor have I heard, that he does not believe in God. If you can cite some links to that, I would be more than happy to take a look at them. I am not defending Obama. I would never vote for him or any other Dem. I simply either don't know for certain the facts to some of which you wrote - nor am I saying you are wrong - I simply don't know. Again, any additional info would be appreciated. Thanks. LOL! That is damn funny, Dave. The ears, how did you make em so large? Good stuff. On the serious side, the man is a Muslim. He Muslim roots are being covered up and not spoken about by the msm. Even Hitlery knows this but her campaign won't leak the information out about it unless he pulls ahead of her in the election. We can't have a Muslim running this country. Woot, Obama is going to be sworn into the white house and have a smoke just to make you all mad. And it won't affect that he will be the best president this country has ever had. I'm so proud to be part of the college generation that gets to vote for him! Taylor - ha ha! Funny! That's strange and not surprisingly hypocritical that the young college crowd would be so pro-cigarette smoking. it is very telling abouth the character and the constitution of the man, obama.it is not difficult to quit smoking, the guy is very weak. I agree he is weak. I'm not fully and totally on board with you that "it is not difficult to quit smoking." It may be for some, harder for others. I will say this; he SHOULD set an example and quit smoking. I say this because this is what The Left would say if a Republican president smoked cigarettes. you gut more goddamned rules on this blog than the IRS has rules about my money. Really? I have more rules than the IRS? Woooo Hooooo!